Lately, I have been on some muffins and cookies kick. It`s really bad, seeing as how these foods are packed with calories. But, hey, I gotta make what I want to make, right? Or else, where will the fun be? (My excuse for almost everything...) Haha. Okay, time for some honest (even deep? okay, maybe not that deep) thoughts. I know I`ve been lacking on my posts per week lately. I`m truly sorry about that. In my ideal world, I want to have a post twice a week. I used to bake at least two or three things in one day, every week, so I had lots of time for baking and trial and error. For the past few months, I`ve baking been baking less, because I have less people to share my baked goods with. I bake very often, it`s true, but I`m not going to tell my readers to eat a ridiculous amount of sweets. Nor, do I want to convince you to eat cake everyday, because it` unhealthy to do so. It`s the truth. I do, however, hope that you will find something you want to make from reading my blog. I do make and eat everything I post, but I cannot eat the whole batch of cookies, or the whole cake, or all one dozen muffins alone. I`ve mentioned a few times about portion control before and I find that it`s key to enjoy sweets in your life, without overdoing it. My freezer always has some frozen baked goods! I always have frozen cookie dough. Sometimes muffins and cake because they all freeze really well. But, honestly, I have less people who I can share my baked goods with now...So, it`s hard to constantly bake when I have cookies and muffins laying around, waiting to be eaten. Of course, I exercise weekly, but it`s simply not enough to allow me to down 4 muffins in one day. What I`m trying to say is, please forgive me for the lack of posts. I really do love baking and I`m learning so much about the baking world. Plus, I love sharing recipes and experiences of what I make! I would never post a recipe I did not like. However, it stresses me out sometimes, because everyone in the blogging world is posting 3, 4, or 5 times a week and I can only manage to do 1 right now. I hope I didn`t bore you with all that blabbering nonsense. LOL. OKAY. Back to these delicious muffins. Nutella, as you all know, is quite famous. Loved by millions. And it`s delicious in basically anything! 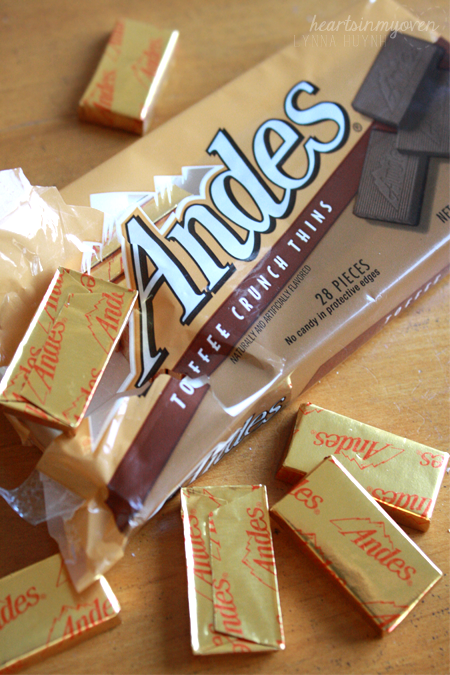 I found some Andes toffee crunch version at Target and immediately added them to my cart. If you can`t find some, it`s totally fine. You can definitely just add some chopped up chocolate instead. 2. Line muffin tins with paper liners or oil tins and set aside. 3. In a large bowl, whisk flour, sugar, baking powder, baking soda, salt, and ground cinnamon until combined. 4. In a medium bowl, whisk egg, milk, sour cream, butter, vanilla, and toffee candy until incorporated completely. 5. Make a well in the flour mixture and transfer wet ingredients into the well. 7. Scoop batter to fill up each muffin tin half way. 8. 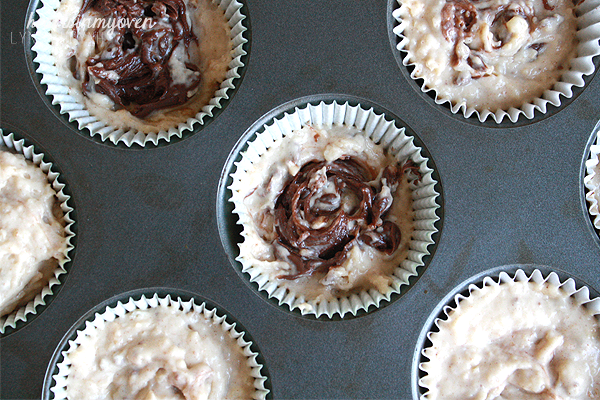 Then, drop some Nutella into each cup and swirl with toothpick. 9. 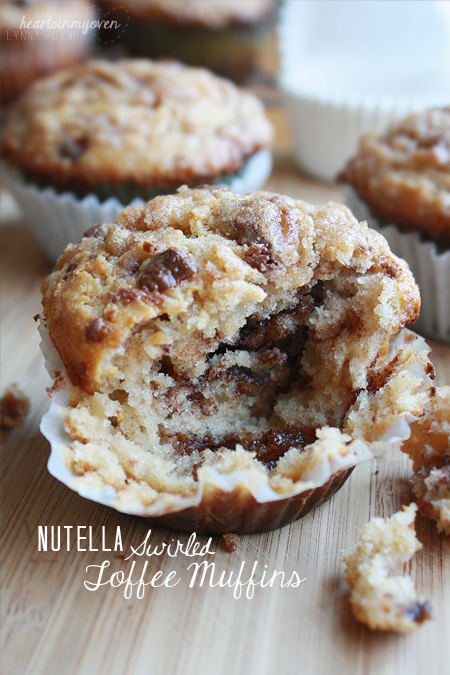 Scoop more muffin batter to top the Nutella swirls. 10. In a small bowl, whisk together flour, sugar, cinnamon. 11. Using a pastry cutter or fork, cut in the butter until coarse crumbs. 12. Add in the chopped Andes toffee chocolate. 13. 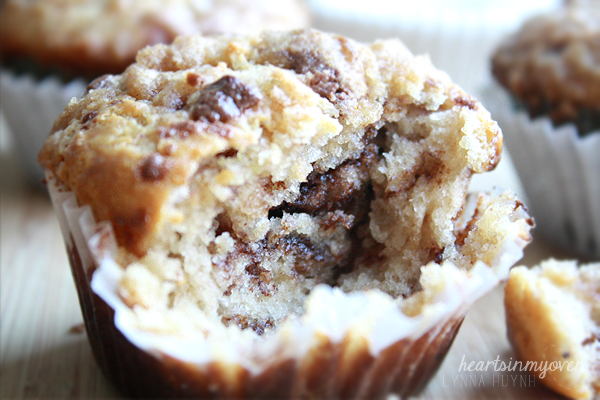 Top each muffin with streusel. 14. Bake for about 16-18 minutes, or until tops are slightly golden. 15. 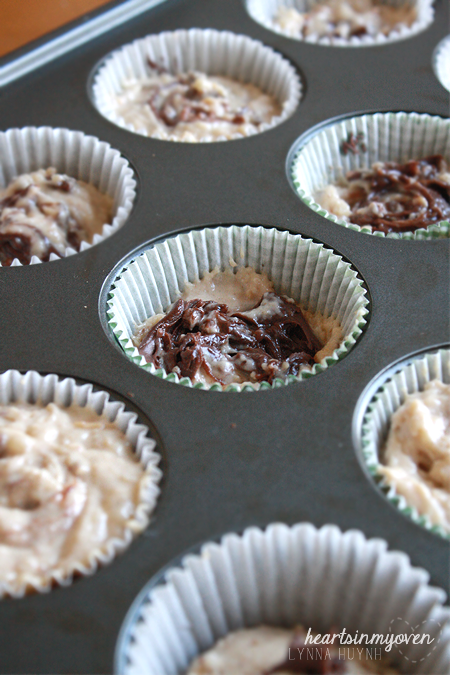 Allow muffins to cool in pan for 5 minutes before transferring to a cooling rack.